Most people make resolutions like “I want to lose weight” or “I want to save more money this year”. Resolutions are like the end zone on a football field, a wide area that we want to reach someday. It may look like it will be easy to get to but we suddenly find obstacles are in the way and we get discouraged when we don’t advance very far down the field. In order to be successful we need Goals. Aiming for the goal posts make our efforts more focused, more specific, and it is more difficult to get us off track. The football is always snapped from the center of the field in line with the goal posts, this gives you room to make your moves and avoid getting sidelined! You know what I’m going to say here: You need to PLAN your way to the goal. 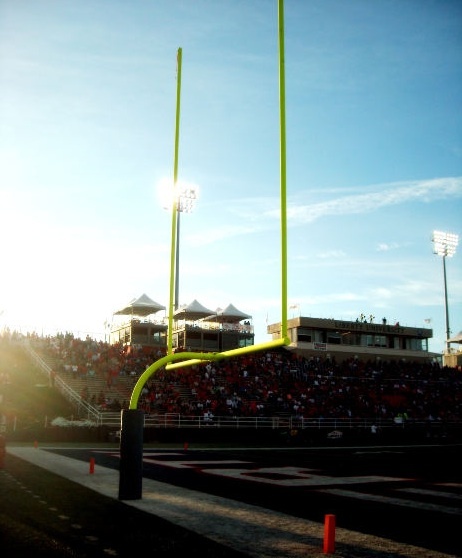 Most touchdowns are not made by throwing the football 50 yards into the end zone. They are made by small, strategic movements in the right direction. You can easily see the progress you have made and stay motivated, ultimately reaching the goal! What are your financial goal posts for 2012? Did you promise yourself to pay off some debt, save for emergencies, put more money into your retirement account? How much or how long? What are some smart money-moves we can make to increase our net worth? Jon White, host of JW’s Financial Coaching Podcast and the Debt Free Living Podcast, lays out our easy-to-follow strategy to help get you started, no matter what your current financial situation is. Need to pay down debt? This plan is for you. Need to save for emergencies? This plan is for you. Want to save for kid’s college? You’ll have to wait until next week’s release of Part 2 but we’ve got you covered. This step-by-step plan allows everyone to jump in wherever they are and head for the goal posts! But you have to first get on the field and play, so let’s get started!